January 7 to 9 is recognized by the Government of India as Pravasi Bharatiya Divas (PBD). Every year Pravasi Bharatiya Divas is celebrated on 9th January to honor the contribution of Overseas Indian community in the development of India. This day was selected to celebrate this event, because it being the arrival of Mahatama Gandhi, the greatest Pravasi in India from South Africa, led India’s freedom struggle and changed the lives of Indians forever. PBD conventions have been held every year since 2003. The convention will provide a platform to the overseas Indian community to meet and exchange their views on matters of common interest. The event will provide an excellent opportunity to develop beneficial trade & business relationships. During the Pravasi Bharatiya Divas celebration prominent Indians will exchange thoughts and feelings as well as Political leaders, social activists, business leaders, writers and artists get together to support understanding during themed events. For contributing in the progress of the country, Pravasi Bharatiya Samman Awards will be given by the President of India to the NRI's. 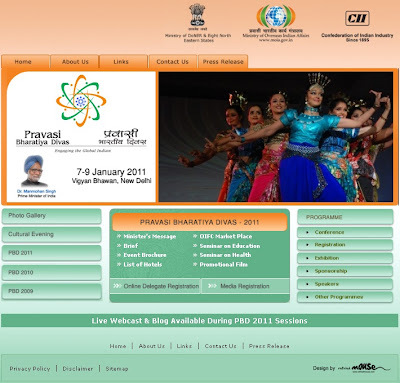 The 9th Pravasi Bharatiya Divas will be held from 7th to 9th January, 2011 at Vigyan Bhawan, New Delhi. The event will focus the North Eastern Region of India and the theme of PBD-2011 is "Engaging the Global Indian”. On 8th January, Indian Prime Minister Dr. Manmohan Singh will inaugurate the convention. President of India Smt Pratibha Devisingh Patil will deliver the valedictory address on 9th January and would confer Pravasi Bharatiya Samman Awards for 2011 to distinguished PIOs/NRIs. For more details and online registration of PBD 2011, visit www.pbdindia.org. Recently, the delegate online registration form is available on the website. This registration process will take approximately 10 minutes. For PBD 2011 registrants, Passport Size photo is required. After successfully completing the registration, you will receive a confirmation letter that will guide you to photo upload process. Till 15 December 2010, each form can be editable. If you are looking for Group Bookings, then contact or mail to pbd2011@in.kuoni.com. Media registration form is expected to be opened from 15th November 2010 to 15th December 2010 at www.pbdindia.org.